Chevrolet Spark deliveries in the United States totaled 1,695 units in January 2017, an increase of 51.2 percent compared to the 1,121 units sold in January 2016. In Canada, the Spark recorded 143 deliveries in January 2017, a sizable increase of 104.3 percent compared to 70 units in January 2016. Fleet sales: Chevrolet saw fleet sales increase 8.4 percent or 2,420 units to 31,362 units in January. Though unconfirmed, the Spark could be a significant part of these sales figures. Competitive advantage: the Spark vehicle is the only modern (and therefore competitive) vehicle in its size and price class in the U.S. and Canada. Its utilitarian hatchback form factor bears some resemblance to a crossover, which could be a draw for customers looking for crossovers but unable to afford them. 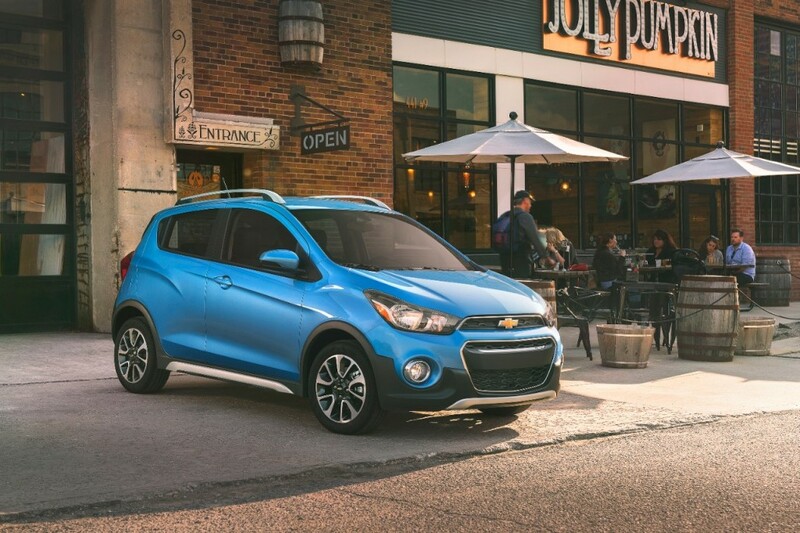 Retail push: we were told by several Chevrolet dealers that GM’s own Chevy regional sales personnel ran promotions for the Spark in December and January, which also could have contributed to the model’s recent sales spike. The Spark received a handful of updates and changes for the 2017 model year, one of which is the addition of the Spark Activ equipment group that gives the city car a slightly more rugged, crossover-like appearance and a higher ride height. Hence, we believe that the addition of the Spark Activ options package will increase interest in the Spark, thereby translating to even higher sales in the near future. The trim level is set to launch in the first quarter of 2017. I really like that GM decided to go with the 5 car lineup, spark, sonic, cruze, malibu, impala. I know they have a SS but it was never going to be long term, although we all wish it was. And even within that that five-car range, there are model variants like the regular Spark, the Activ, Sonic sedan and Sonic hatch, plus the Cruze sedan and Cruze hatch. Now, if only there were performance variants of the Sonic, Cruze, and Malibu, that would just be gravy. Model spacing was better with Aveo, Cobalt, Malibu, Impala. The 1st gen Cruze squeezed the Malibu. The roomier Spark and current Cruze(+hatch) squeeze the Sonic. The best spot for FWD sporty is the next Sonic. This is a for the US point of view. I know other markets use alphabet designations. In what world was the segment spacing “better” with the Aveo, Cobalt, Malibu, and (W-body) Impala? Heck, it you would not be able to call that “good” let alone “better”. The Malibu was stepping all over the Impala, the Cobalt was the least competitive car in its segment, and the Aveo only damaged the Chevrolet brand. The only decent/good product from that era was the (seventh-generation) Malibu. The spacing is significantly better with the current lineup when it comes to vehicle size (segment/class) and price. There is clear delineation across all five models, and the Sonic and Cruze in no way “squeeze” the Sonic… especially based on price and styling (the Sonic is styled like a “real” car, while the Spark screams entry-level… despite being a good vehicle). I worded it that way with intention of size and not a comment on quality at all. Especially with buyers shifting to crossovers, is going back to 4 that outrageous? I’d still say that based solely on size (and associated price) from the Sonic to Cruze to Malibu to Impala, there is clear delineation. And the Spark is smaller than the Sonic still, so I don’t see any issues here. Buyers are shifting to crossovers, but no one knows if that shift is permanent or temporary, so I would strongly advise against making any decisions regarding a particular brand’s car lineup based solely on a shift that’s been a maximum 24 months in the making… especially given the advantages of having a city car (Spark) and a subcompact car (Sonic) in the lineup compared to rivals. Now, if I am understanding your comment correctly, going “back to 4” would involve cutting the Spark, right? But a vehicle like the Spark is now even more important to GM given its withdrawal from Europe, and the potential/eventual re-introduction of Chevy there. However, I think there is an argument to be made to make the Spark a smaller, three-door-only city car along the lines of the Opel Adam. Alex, to add my opinion on the CUV shift. I think this is mainly seen in vehicles >$25,000 maybe $30k. I don’t think there is a correlation between Traverse sales increases and Spark sales (even though you hyperlinked a Traverse sales article within the context of Spark sales) However, I do think the general trend is toward cars with greater functionality. The Chevy hatchbacks (Spark, Sonic & now Cruze) offer the versatility of a CUV at a lower price point for those who can’t afford the Equinox or Traverse. So, while the CUV shift is happening, the hatchback sales are also a function of that. Further validation of this thought may be shown if the new Cruze hatch sales take off while Cruze sedan sales remain flat or decrease. Thank you for the reply Alex. I stand corrected on the size differences. Yes, the car I’d consider dropping would be the Spark, just for the U.S. I guess it’s an anti-small car perception bias, even though I’ve driven relatively small vehicles. It is over said, but gas is cheap and the urban road surfaces I know are very poor. It would be interesting to know what percentage of Spark (or any lower price model) owners next car is a Chevy or GM? What is considered good? Maybe you could do without them… but the market says otherwise. In addition, vehicles like these have various indirectly tangible benefits like improving brand image/cachet. Look at Ford, VW, Honda, Hyundai, Kia… even comparatively tiny Subaru has sporting variants of its compact and/or subcompact “commuter cars”, as you call them. Benefits abound. Large, big, hairy benefits, my friend. I own a 2015 Chevy Sonic RS and wish there was a performance version of it. 😉 I’m sure there will be a few Spark EV customers that will purchase it for the low end torque. I agree with Alex’s reasons. So what are you going to get with a performance option on the sonic? 20 more hp a little better handling, and a body mod? I meant my comment somewhat sarcastically. The 2015 RS model already had some suspension and cosmetic improvements. The ‘performance’ improvement for the powertrain was to install a lower final drive for a bit more pep off the line. A boost of 25 HP would do wonders for 50MPH and above and can be accomplished by ECM tuning. GM could have done that easily without requiring anyone to void their warrantee by going to DDW or Trifecta. I’m not worried about outrunning anyone, just better merging in traffic. If I want to outrun someone, I have a 1972 Grand Prix with 600+ HP.